11th Annual Fun-Fit Snowshoe Adventure — FitLiv – Boulder’s Original Fitness Boot Camp & Outdoor Yoga Program. Ya hoo! It's time for our 11th annual snowshoe adventure. On Saturday, January 27 our destination is the remote and cozy Brainard Lake cabin in the Indian Peaks wilderness. The mission of FitLiv has always been to help motivate, educate, support and encourage adults to get fit, get outside and get active! In keeping with this goal we are proud present another of our popular Fun-Fit Adventures. Our Fun Fit Adventures, which of course are a combo of Fun and Fitness, are free and open to the public so feel free to invite along friends. Space though is limited to only 8 and our annual Brainard Snowshoe typically fills so register early. When: Saturday, Jan 27, 8:30 a.m. - 4:30 p.m. 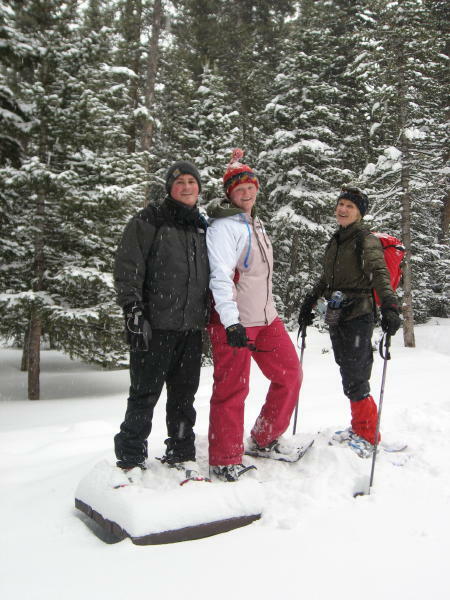 The Adventure: This snowshoe trip is appropriate for adults of reasonable fitness level. If you are able to hike 8+ miles during the summer months then you should be fine on this snowshoe hike [6 miles snowshoeing feels much longer than 6 miles of summer hiking]. We will enjoy a social pace and no one gets left behind. The distance is 6.2 miles round trip over moderately rolling terrain. We will be on a snowshoe-only trail so we won't have to worry about skiers zooming by us. No previous experience required. If you can walk you can snowshoe - but once again you should be comfortable hiking 8 miles. If you have not tried this ever-increasingly popular sport before definitely join us. Meeting Location: Boulder Justice Center parking lot at 8:30 a.m. - 6th St and Canyon in Boulder. We will meet here and carpool to the trailhead together. Once you register we will send you more info via an email. What to Bring: Insulated boots (comfortable waterproof hiking boots with good wool socks should also work), warm clothes (preferably consisting of several layers), wind shell, wind pants (any nylon type pants as you will kick a lot of snow up the back of your legs), hat & gloves, day pack, sunglasses, water bottle, sunscreen, sack lunch and snacks and a dollar or two for tea or cocoa at the cabin. You will also need snowshoes. Poles are also handy as they help with balance especially if you venture into the untracked powder. You can always use ski poles (preferably cross country poles) if you have them..
Snowshoe rentals are available at a number of spots and here are a few to try. You can pick up the snowshoes the day before in the afternoon or evening. Note that this information was compiled in 2008 so there could be some errors (pricing for one...) but it is a good starting point for you. $24/day for members [$32 non-members] by reservation. If you have any questions at all don't hesitate to contact David at 303-550-3491. Space on this trip though is limited to only 8 so make sure to register early.